On February 22, 2017, NASA has announced that seven Earth-sized planets have been observed by NASA’s Spitzer Space Telescope around TRAPPIST-1, a tiny, nearby, an ultra-cool dwarf star located 39 light-years (12 parsecs; 370 petametres) away from Earth in the constellation Aquarius. The good news is: three of these planets are firmly in the habitable zone. The new discovery may be a great breakthrough in the search for extraterrestrial life. 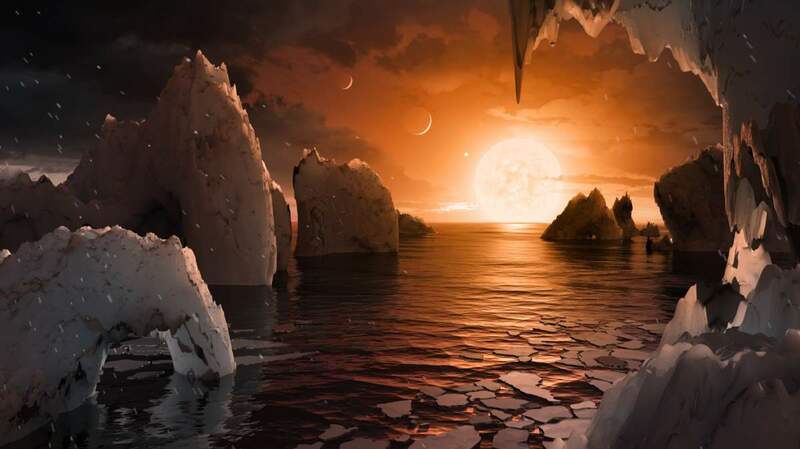 In fact, three of these seven planets are already known: In 2015 a team of astronomers headed by Michaël Gillon of the Institut d’Astrophysique et Géophysique at the University of Liège in Belgium discovered three Earth-sized planets orbiting the dwarf star. Gillon and his team used transit photometry with the Transiting Planets and Planetesimals Small Telescope (TRAPPIST) at the La Silla Observatory in Chile. On February 22, 2017, astronomers announced four additional exoplanets around TRAPPIST-1. TRAPPIST-1 System vs Solar System: the known data on each of the seven planets of TRAPIST-1 compared to the rocky planets (Mercury, Benus, Earth, Mars) in our Solar System. Despite three of the planets are in the habitable zone, this does not mean we found extraterrestrial life: the life itself depends on a number of factors: for example, we still don’t know if these planets have atmospheres allow water to remain as liquid. And, since the star is 10 times further away than Proxima Centauri (from Latin, meaning “nearest [star] of Centaurus”) in the Alpha Centauri system, we don’t have much hope of sending a spacecraft to this system in the near future. The planets may also be tidally locked to their star, making alien life less likely. Tidal locking is the name given to the situation when an object’s orbital period matches its rotational period. A great example of this is our own Moon. If they are tidally locked, this means the same side of the planet is always facing the star, therefore each side is either perpetual day or night. This could mean they have weather patterns totally unlike those on Earth, such as strong winds blowing from the day side to the night side, and extreme temperature changes. The 360-degree panorama below depicts the surface of a newly detected planet, TRAPPIST-1d, part of a seven planet system some 40 light years away. You can explore this artist’s rendering of an alien world by moving the view using your mouse or your mobile device.